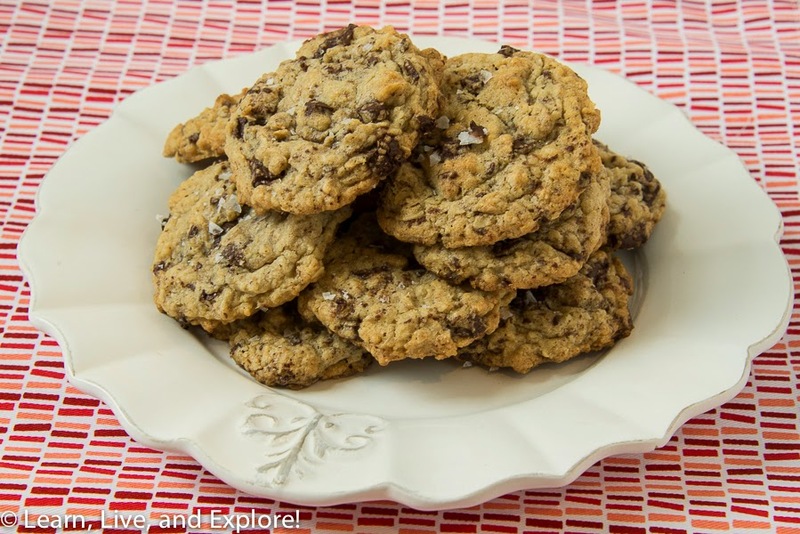 Salted Oatmeal Chocolate Chunk Cookies ~ Learn, Live, and Explore! I have become a big fan of salted desserts in the past few years, and one of my favorites is a salted oatmeal version of a chocolate chip cookie that is available at a restaurant near my house. So, a quick search on the internet, and I found this recipe that produced some similarly delicious cookies! And they were very easy to make, so there's no excuse not to try this at home. Heat oven to 375F, placing the racks in the upper and lower thirds of the oven. Cream together the butter, shortening, and two sugars in a stand mixer, beating until fluffy on medium-high. In a separate bowl, combine all of the dry ingredients (oats, flour, baking soda, cinnamon) and the 1 tsp of sea salt flakes. Add the dry ingredients, gradually on a low speed, to the wet ingredients in the mixer until combined. Line baking sheets (silpat or parchment) and use your fingers to create 1 1/2 inch balls of dough. Sprinkle the cookies with more sea salt flakes.